Located on Bridge Street, Deansgate lies a hidden Turkish treasure. 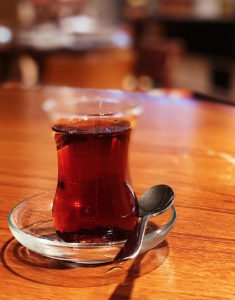 Café Istanbul celebrates the authentic depth of Turkish flavours and boasts them on Manchester’s door step. 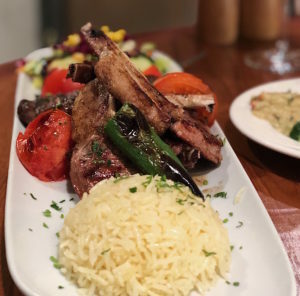 Café Istanbul serves as Manchester’s longest established Turkish restaurant (around 40 years) and it’s no surprise that with great experience, comes great tasting food. The menu presents an array of classic Mediterranean dishes, from Baba Ganoush, Lamb Shish to Mezze platters. All of which are elevated with an authentic sophistication. We began our Mediterranean feast with a sort of – ‘self-made’ mixed Mezze. (Which basically just means everything sounded so delicious, we ended up ordering half the menu). We were recommended the ‘Findik Lahmacun’ (£4.20) which consisted of two small freshly baked pastries topped with minced lamb and diced vegetables. These were essentially miniature versions of hand-made Turkish pizza (of which they offer as a variety of full sized mains). Also ordered were the ‘Cheese rolls’ (£4.90) which were created by frying rolled feta cheese pastry with spinach, egg and parsley stuffing. 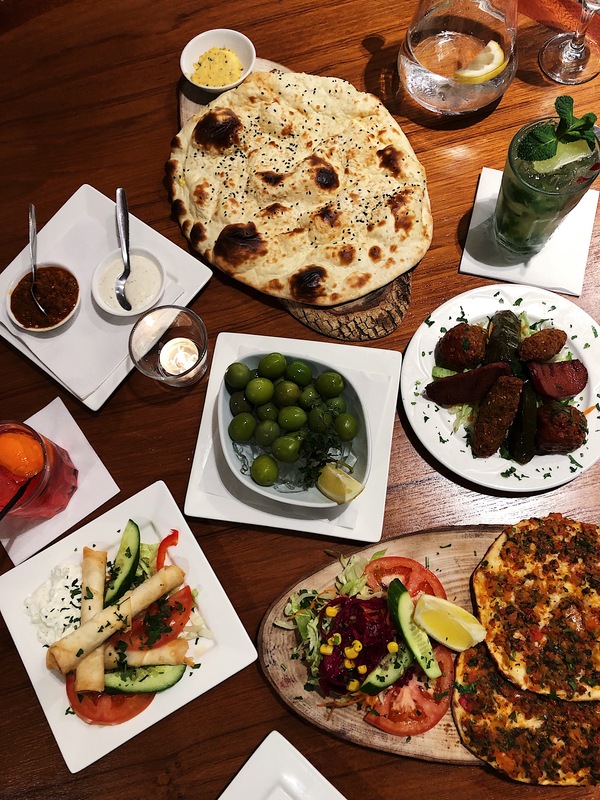 We had a side of freshly baked traditional Turkish bread served with a herby garlic butter, green olives served on ice and a selection of the chef’s specials. Along with falafel, Turkish sausage and stuffed vine leaves, the chefs served their hand rolled meatballs which deserve a special mention. The meatballs consisted of tender minced lamb, delicately seasoned with onions and herbs and served with a rich tomato sauce. Always trust a chef’s recommendation. To top off our banquet of a starter, we ordered a couple of refreshing cocktails, to give ourselves that true ‘holiday feeling’ and sat back as we were transported into the Mediterranean. 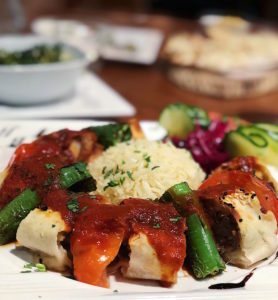 For the main event, we ordered the ‘Iskender’ (£13.90) which was created from lamb, wrapped in a thin layer of toasted warm bread, topped with an Anatolian tomato sauce and served with grilled vegetables, a bed of rice and yoghurt. At this moment, I was having the realisation that the harder it was to pronounce the dish, the more delicious it was going to be. And for those of us who are not fluent Turkish speakers, fear not. I am happy to report that there was absolutely no shame in resorting to the good old fashioned ‘smile and point’ in true British fashion. The attentive staff are more than happy to translate. The ‘Iskender’ was cooked to perfection. Tender lamb, which I had become accustom to expect, drizzled in a rich and tangy tomato sauce that left your taste buds wanting more with every bite. Also ordered were the ‘Lamb chops’ (£15.90) from the grill. Kuzu Pirzola succulent marinated lamb chops served with char-grilled vegetables, accompanied by a bed of rice and a helping of fresh salad. Stuffed and satisfied, we opted for a Turkish Tea to finish our meal. Served traditionally in a small, tulip-shaped glass the flavours were beautifully light and delicate. Café Istanbul’s authentic menu transports you to the Mediterranean for a well deserved holiday. Tender meat, flavourful sauces to freshly baked baked bread. What’s not to love? This restaurant is not only for those with a Mediterranean heritage looking for a home comfort, but should be experienced and enjoyed by first timers too. The attentive staff will welcome you in, and make you feel like part of the family.